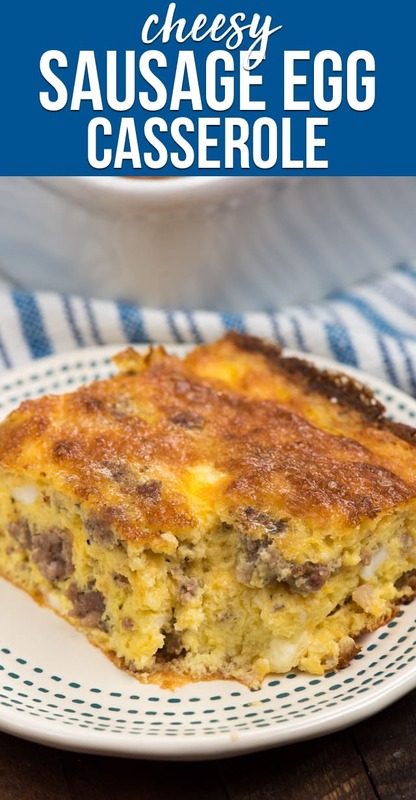 This Cheesy Sausage Egg Casserole is the perfect brunch or breakfast recipe! 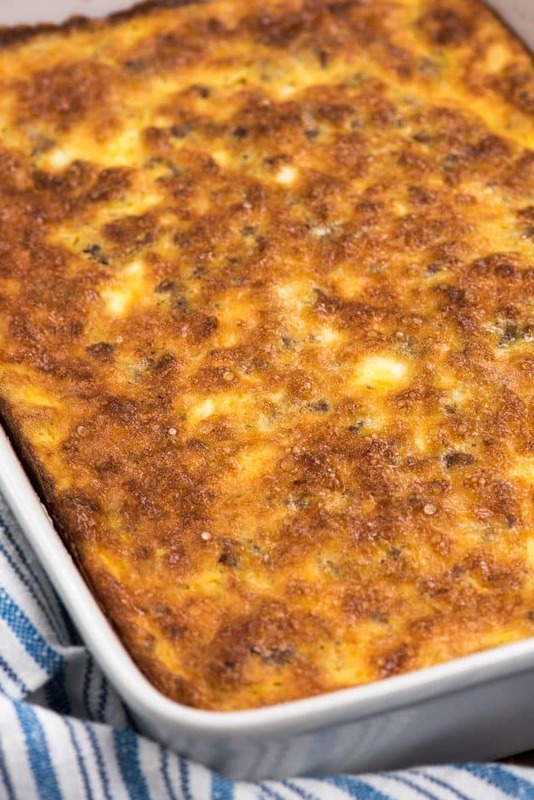 Eggs and sausage and cheese all baked up in a pan, everyone loves this recipe! Remember my Christmas Eggs? This is another version of that recipe, but with SAUSAGE! Goodness knows, this was a HIT. That time I edited photos and got really mad at myself for not throwing some parsley in the shot. Like…could these photos BE MORE BROWN? (Said in Chandler’s voice.) Sigh. But then I remembered that I made this casserole for brunch and had 15 hungry people waiting for me to photograph the casserole already. So…I have an excuse why I forgot the garnish. 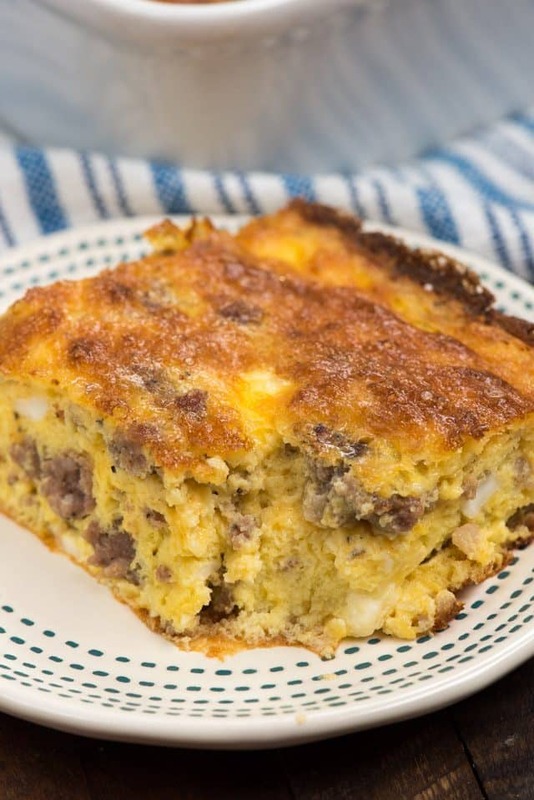 A good sausage egg casserole is full of eggs and sausage and cheese. 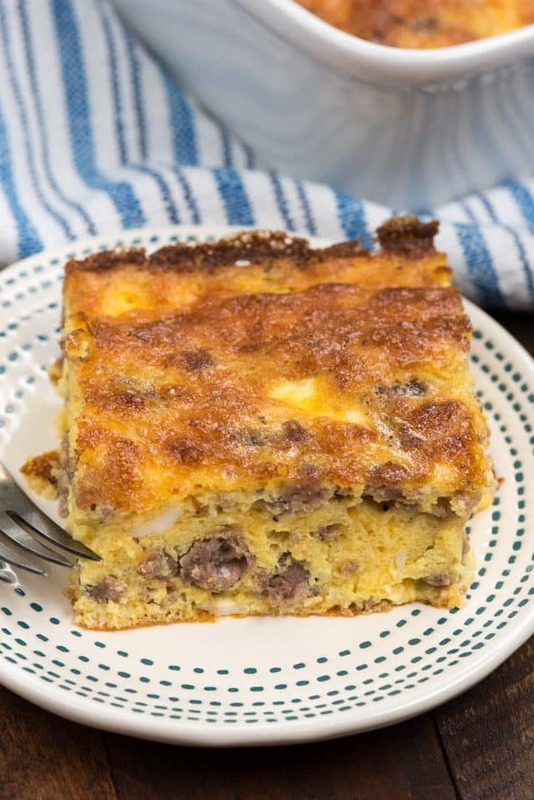 This sausage egg casserole has no bread – which is why I love it. When I serve brunch I like to serve something sweet, like cinnamon rolls or French toast. When you’re eating muffins, you don’t need bread in your eggs. An easy egg casserole full of delicious breakfast sausage is what you need for Sunday brunch…or just a random Tuesday. We often make this on Sunday morning and then freeze slices for during the week. Even my picky eater loves this casserole! Brunch is such a fun thing to host. 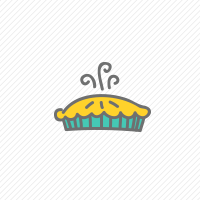 It’s great at any holiday (Easter, Christmas, Mother’s Day) and is always fun and full of great food. 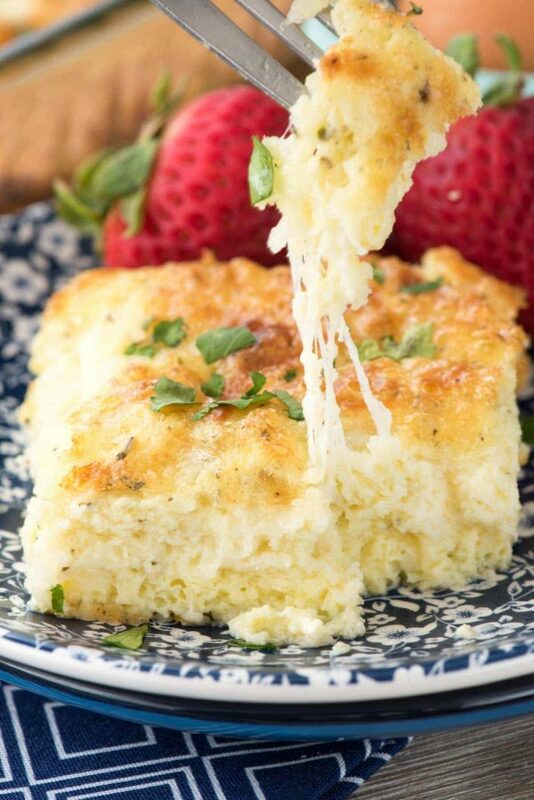 If you’re looking for an easy brunch egg casserole, this is the one for you. Everyone loved it and it’s full of sausage and cheese and the perfect potluck meal. I know a lot of egg casseroles are overnight egg casseroles, but you don’t have to do this one overnight. You can cook your sausage the night before, if you want, but it whisks together in about 10 minutes and then goes straight into the oven. If I can make this on Christmas morning, believe me, it’s easy enough to make for your family for brunch. We all know I’m not cooking big breakfasts before 11am…even with a mimosa. Cheesy Sausage Egg Casserole is an easy egg recipe full of cheese and sausage that comes together in minutes. There’s no bread in this recipe and everyone loves it! You can cook your sausage the night before. Make sure to drain the fat. I used cheddar cheese but you can use mozzarella or Monterey Jack too. Add some green chiles or Italian seasoning for even more flavor! I hate cottage cheese, so if you think it’s a weird ingredient, don’t worry. It’s just for body and cheesy flavor, you won’t notice it’s there. Preheat oven to 400°F. Spray a 9x13” pan with nonstick cooking spray. Cook breakfast sausage in a medium skillet over medium-high heat, breaking into crumbles. Cook until no longer pink. Transfer to a plate covered with paper towels and pat away the excess fat. Cool at least 10 minutes. Stir together butter, cottage cheese, cheddar cheese, flour, baking powder, pepper, and salt. Whisk in eggs and whisk until combined (mixture will be lumpy). Stir in cooked and cooled sausage. Pour into prepared pan and bake for 30-40 minutes or until browned and set in the middle. Cool 5-10 minutes before slicing and serving. Best served fresh, but it can also be sliced and stored in individual containers and frozen. Defrost in microwave. Use any kind of sausage and any kind of cheese! 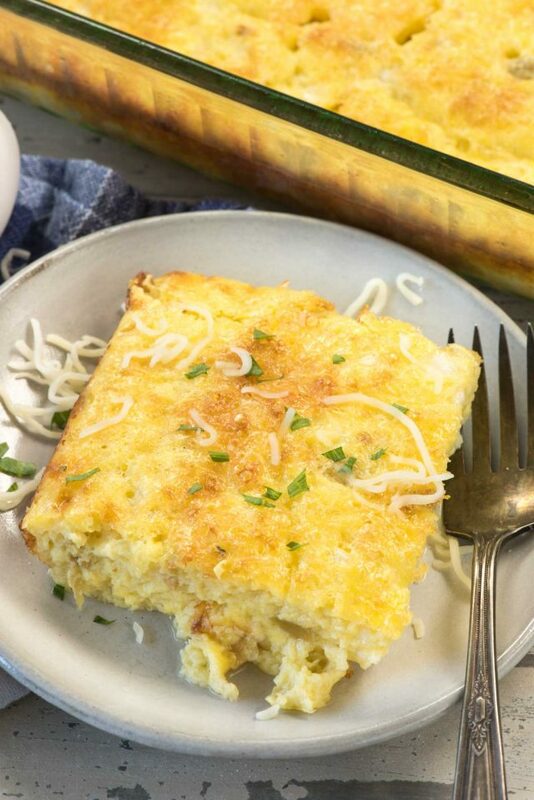 I just love egg casseroles and can’t wait to try a copycat Cracker Barrel Ham and Egg Casserole, Aimee’s Cheesy Overnight Egg Casserole, or Karen’s Bacon and Egg Casserole! Cheesy Egg Casserole is my first version of this recipe! Green Chile Egg Casserole is a classic. 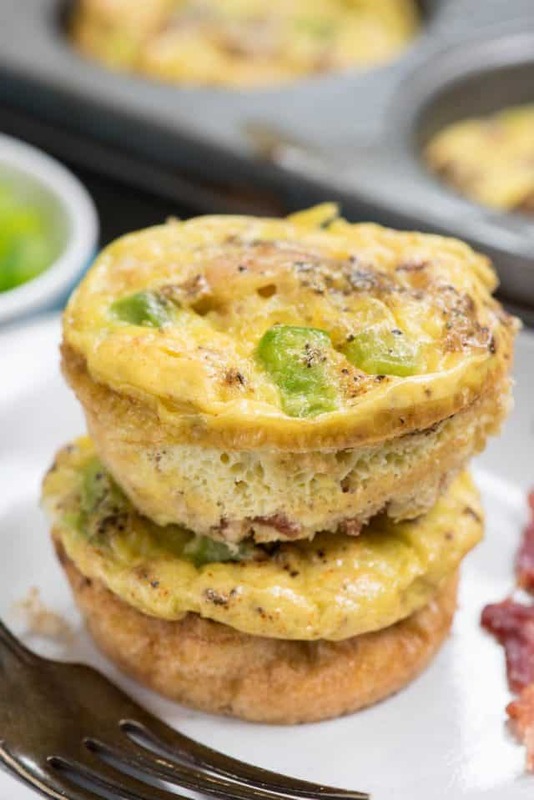 Egg Muffins are everyones favorite!